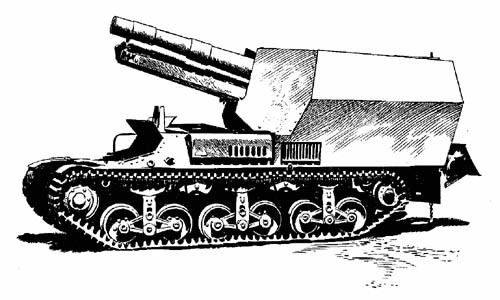 The following WWII intelligence report on the German 150-mm self-propelled medium howitzer mounted on captured French tractors was originally printed in Tactical and Technical Trends, No. 12, November 19, 1942. The 150-mm medium howitzer, sFH 13, has been provided with a self-propelled mounting, the chassis of the French tracteur blindé 38L, made by Lorraine. The particulars of the mount 38L are: length, 14 feet; width, 5 feet 2 inches; weight, 7 1/2 tons; engine, 70 horsepower; maximum speed, 22 miles per hour. (c) A spade on the rear of the hull that can be let down to take recoil stresses. It is notable that in this case an equipment firing a 92-lb shell to a maximum range of 9,300 yards has been mounted on a hull weighing no more than 7 1/2 tons. This is another case in which the Germans have utilized a standard field gun to make self-propelled artillery. A recent picture shows another 150-mm howitzer, the 15-cm sIG 33, on a German Mark II chassis with the gun on a special mounting built into the hull. There is a three-sided shield no higher than the normal tank, instead of the very high box-like structure for the self-propelled sFH 13.